welcome back to Day 11 of the 12 Days of Christmas Card Video Tutorials! I am excited to show off a few different styles using the same two stamp sets to show you how versatile stamps can be. I also wanted to show off how you can mix in non-holiday stamps to stretch your stamps to a whole new level. Today I created clean and simple, traditional and elegant style cards. For these cards, I used the Halftone Stars Stamp by Altenew along with the Evergreen Sketch stamp which is a beautiful layering stamp that I actually used in last year's series. Both stamps are very versatile and can be used on numerous occasions. You can use the halftone stars for birthdays or celebrations and the Evergreen Sketch for tree and forest scenes. For the card above, I stamped the star in the centre of the card. I imagined it to be the star on top of the tree. I took the third layer of the Evergreen tree and stamped it along each indent of the star in versa mark ink and embossed it in gold. On the star points, I laid down some Nuvo Drops that matched the embossing powder. The sentiment is from the Holiday Wishes stamp but you can substitute any Christmas sentiment. Although, it is a recommended set because it has great sentiments for the insides of cards. For the two cards above, I created a traditional card with green evergreen trees. These gorgeous layering stamps give it a dimensional look but it's not super realistic looking. I like the playfulness of the layers. For the third card, you can't get much more clean and simple. I die cut small stars from the Halftone Stars stamp and added them in the shape of tree. The Persian Blue colour is very striking. Thank you to Altenew for Sponsoring a $25 Gift Certificate! Great set of cards! Love the designs! These are stellar! I particularly love the tree stamp, and using it as rays from the star is brilliant! Love the multiple uses of one stamp set. Those are fantastic, I was looking for some easy inspiration for a group of non card maker girls that want o have a go at making some Christmas cards. These would not overwhelm them or take too long to make. Justine I so enjoy your you tube videos. This card is so elegant crisp and clean. You gave me ideas for my Christmas cards this year. Thanks for inspiring me to create. Merry Christmas! Very nice...great stamp sets and card examples. 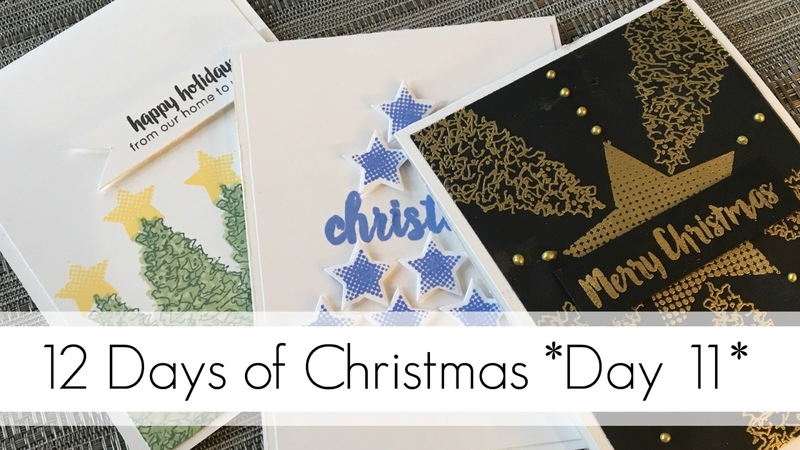 Oh Justine, these are such great cards and I am so sorry that tomorrow is the last day of your 12 days of Christmas:( Has this 12 days gone by this fast for you??? Oh...I will miss this...day 11...so pretty!!! Like them all! Embossed card is my favorite! Love the cards - very pretty. Thanks again Justine for another great video. I love the gold on the black. of the drops make a fantastic card. The line of trees is great too. Love how you stretched the stamp for the gold embossed card! Looks like light rays shooting from the star! Love the cards today ! Innovative use of the stamp sets to create three very different cards. Thanks for sharing! Absolutely fabulous cards!! I love getting the most out of my stamps! Really lovely cards and nice ideas for using other stamps for holiday cards. Thanks! Such great ideas, love the last card. Altenew has awesome stamp sets and love the coordinated ink colors, makes stamping so easy. Beautiful CAS cards Justine, love the last one done in black and gold! So elegant! So pretty. The last card with the gold embossed trees and star, reminds me of laying on the ground looking up at the sky through the trees... so fun. I'm new to your YouTube channel and it has been a lot of fun watching this series. Now, I have been going back and watching some of your older '12 days' and gleaming so many ideas! Great cards. Love the way you can stretch your stamps. The black and gold card is absolutely stunning. Thanks for sharing your talents with us. Wow, beautiful cards!! Love the stamps and it's great to get ideas on how to use your stamps for other holidays!! Love your videos! Love these stamps sets, great job on mixing sets to create something new. TFS! All the cards are fabulous! Id like to try the Altenew inks!! It’s nice to see simple cards that are also elegant. These are wonderful designs. Thanks for sharing Justine! I love the dimension you get with layering stamps on my projects! I too like to invest in stamps that could potentially be used all year round. There is alot to be said for versatility! Thanks so much for sharing more great ideas with us...your cards are beautiful, Francine! Beautiful cards! I love Altenew's stamp designs! Haven't tried their inks yet, but I would love to! So pretty, I love this star set! I have so enjoyed your 12 Days of Christmas series, I'm sad there is only one more day. I like how you used the trees on the cards. Thank you for sharing. another inspiring collection of cards Justine! Love the black and gold card. So many great examples here. I love how you've showcased the versatility of these products. Such versatile stamp sets! Inspired!! Fabulous cards!!! Thank you so much for doing this series Justine!! You have inspired me so much!! With thus being my first Christmas as a Card maker, I had no idea where to start!! You have helped me so much!!! Big Hugs!!! So beautiful! Thank you for inspiration! Great cards. I love that you only used 2 sets and created 3 unique and beautiful cards. Thank you for sharing. Beautiful cards. Especially love the one with halftone stars. These are wonderful cards Justine! Love how you turn a simple technique into fancy cards! Thanks for sharing these great card ideas! Thanks for the lesson on stretching our stamps. I love the cards. These cards are very sweet..
Gold and black for a Christmas card? LOVE!!!!!!! So nice and elegant!!!! Some great ideas especially for those just starting out, or with limited space, helps me see my stamps in a different light. In these photos you can really see the stunning detail on the trees! Glad I saw these photos! The video was great too! Loved that you did three cards! Thanks for the inspiration on how to use our other sets of stamps for holidays!! Absolutely stunning! I especially ❤️ the trees with the star ⭐️ in the middle! TFS! You are so amazing. I love all the fun projects you created today. You created another set of pretty cards using these Altewnew stamps Justine. My favorite is your last example with the gold embossing. I've been wanting to try some stamps from Altenew. They make beautiful products. all the cards are very pretty! and an awesome way to use the star stamp! Love the cards, great way to mix stamp sets. Love the altenew half tone sets!! I like the creative cards you made with these two stamp sets. I love the christmas tree card! Another great day of awesome cards! Love the gold on black. So elegant! I like all 3 cards, but the last one is my favorite. Love that layering tree set! Thanks for demonstrating its versatility. Another day of beautiful cards! What a great group of cards. 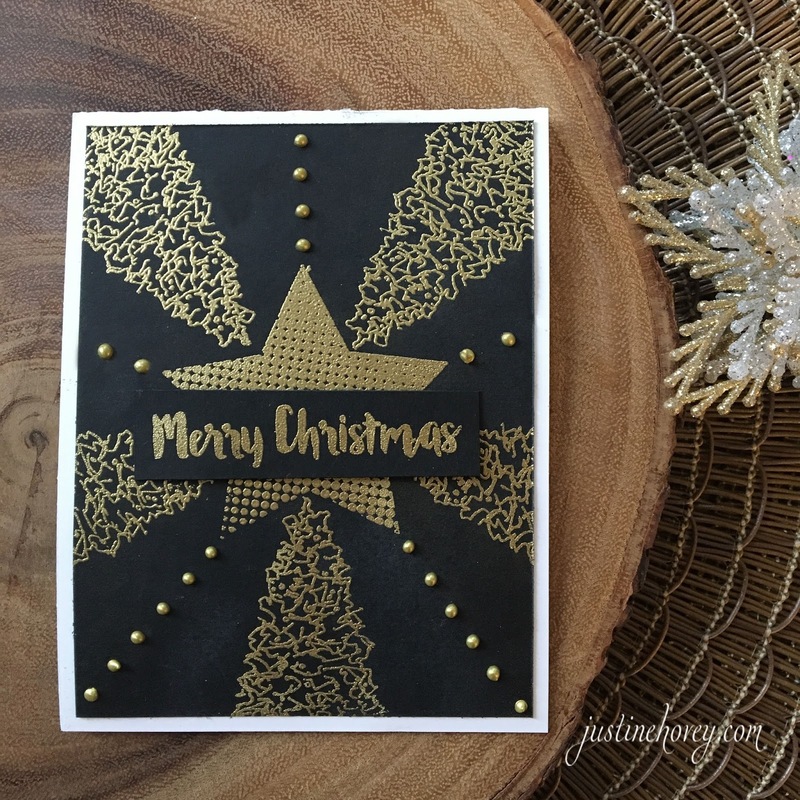 I really like the fun way you used the Altenew tree stamp on the black and gold card. I like how you used normal stamps for the cards along with the Christmas Stamps. Don't have alot from Altenew, but what I do have, I love! I like the star tree card with Christmas inserted in the middle. Thanks for sharing! You are so creative! Thanks for all the Inspiration! Once again great ideas on how to get more out of yur stamp set. The trees are beautiful. Love Altenew's stamps & dies. I have enjoyed the this event. Thank you. Love the card with the layered trees and star topper. Those stamp sets look great mixed! The black and gold card is gorgeous! I like your star tree idea too! These are fantastic! Love the gold embossing on the black! I love that tree set! I love these creative cards! The black and gold one is my fave. Love all these tree cards. My favorite is the black and gold, just such a fun, graphic, modern design. Beautiful cards! I seeing how people use their stamps in ways that aren't obvious! Great cards, Justine! Clever use of the stamps. I have truly enjoyed the 12 days of Christmas with you. Thanks so much for all the wonderful inspiration. What a great way to use all those stamps! I love the idea of making Christmas cards using stamps that you are able to use year round. All 3 of yours were perfect! Love this idea. Gold on Black is to stunning. Beautiful Christmas cards, all so elegant and I love your style! The gold EP on black CS is my favorite, stunning! I really love the tree stamp set! It's really lovely. love these cards!! really want new stamp sets for this Christmas!!!!! I love those layering trees and those gold nuvo drops are really fun! 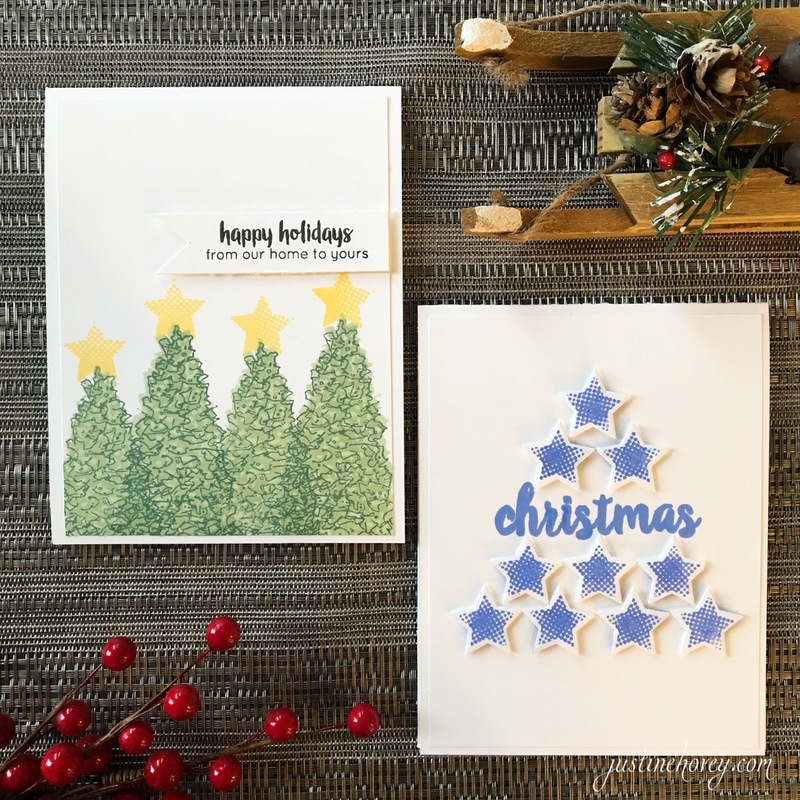 Great cards, love the different designs and the Altenew tree stamp and stars stamp and die. My favorite is the black and gold embossed card. Love the star tree! And the simple trees with the half-tone star on top. And all of your creations! Great cards. Love the Altenew stamps. These cards are truly awesome! I love what you do with your stamps. You make me realize I need to get my stamp stash out and get busy making some cards. Love how you made these cards. Great card ideas. The gold card is truly elegant. Great cards! I've enjoyed your 12 days of cards. One more left! All of those cards ended up on my Pinterest boards but I especially love the last card! Beautiful and stunning as always Justine! Thank you for sharing. I really appreciate finding outside-the-box uses for my supplies. thanks for the inspiration! I love the idea of mixing non-holiday sets -- so many options! These are fantastic cards!! I have never thought of using my layering stamps for anything other than layering. You did a great job!! I love the gold star on the dark back round. So fun! Great variety of cards, love some simple stamping. Wonderful set of cards. Thanks for the very inspiring video. I really love the gold embossing on the dark card, lovely and elegant. Thanks for sharing. All three of your cards are awesome but that black and gold is definitely my favourite. I have also covered mistakes the same way! Love it when we see that cardmaking isn't always perfection! I love the tree stamp set - beautiful! Very pretty cards! I love the stars making the tree. Very clever! These cards are so great! I really like your ideas. Great ideas. It makes you look at you stamps in a new way. Thanks for sharing this with us. I think the Half Tone Star set (and Circles too) are so versatile and can be used for so many occasions. Great examples! And I love your last card the most for its creative use of the layering stamp!!! THESe are absolutely beautiful! So much gorgeous inspiration in this series! Great cards! Really love that star stamp set and you used it beautifully to make some lovely Christmas cards! These are absolutely beautiful cards ! Thank you for 12 days of wonderful cardmaking ideas, getting sponsors, and being so inspirational to those of us who haven't got our self-confidence as high as we would like about making cards. What fun ideas! I like how you had only the tops of the trees showing in the 2nd card. Really cool idea, Justine! As I love layering stamps, I thought the trees were amazing!! So fun! Thank you for always inspiring! Fun to use stamps in different ways! I love making Christmas Cards and I love all your ideas. Such great cards! i love the black and gold card, using the second layer of the tree as 'light' coming from the star is ingenious. Thanks for the inspiration! Love the gold card. The layered tree is also nice.